Over 3.2 million people have been registered sick with flu and acute respiratory disease since the start of the epidemic season. 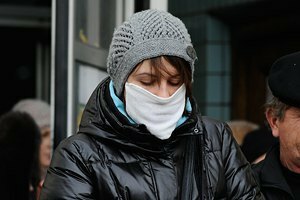 Since the start of the epidemic season, 171 people, including two children under 17 years old, have died of flu in Ukraine, the Health Ministry has said. The highest number of fatalities was seen in Odesa Region, 33, Vinnytsya Region, 13, Zaporizhzhya Region, 12, and Rivne Region, 11. "Only one third of those who died requested medical assistance on time. The analysis of fatalities showed that none of them had flu shots," it said. As of 31 January, 11 regions have exceeded the epidemic level by over 50 per cent. These are Volyn, Dnipropetrovsk, Kirovohrad, Poltava, Rivne, Sumy, Ternopil and Chernivtsi regions.